Southwest monsoon has further advanced into some more parts of Odisha, most parts of West Bengal and some parts of Bihar and Jharkhand. The Northern Limit of Monsoon passes through Lat. 21°N/ Long. 60°E, Lat. 21°N/ Long. 65°E, Veraval, Amreli, Ahmedabad, Khandwa, Amravati, Gondia, Titlagarh, Angul, Jamshedpur, Supaul and Lat. 27°N/ Long. 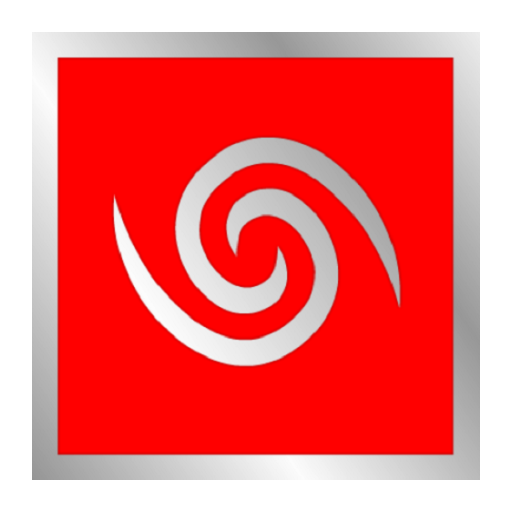 86°E, . 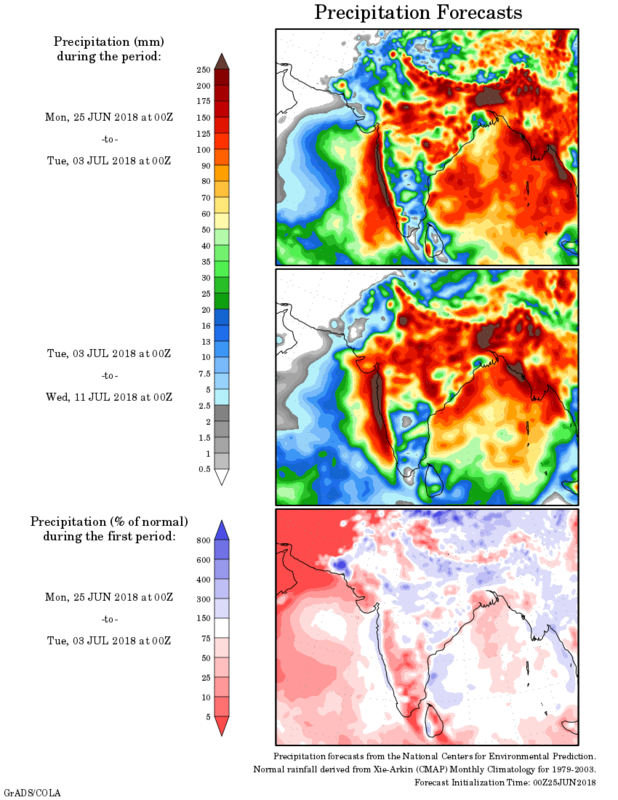 Conditions are becoming favourable for further advance of Southwest Monsoon into some more parts of north Arabian Sea, Gujarat State; remaining parts of Maharashtra; some more parts of Madhya Pradesh, Chhattisgarh; remaining parts of Odisha, West Bengal, some more parts of Jharkhand and Bihar and some parts of East Uttar Pradesh and south east Rajasthan during next 48 hours. Conditions are likely to become favourable for further advance of Southwest Monsoon into remaining parts of Madhya Pradesh, Chhattisgarh, Bihar & Jharkhand and some more parts of Uttar Pradesh during subsequent 48 hours. Pre­monsoon thunderstorm activity is very likely to commence over parts of northwest India from 26 June. Subsequently, advance of southwest monsoon is also likely over parts of northwest India including Delhi during 28th June­1st July. ઓફશોર ટ્રફ દક્ષિણ ગુજરાત થી કેરળ સુધી સી લેવલ ઉપર છે. એક યુએસી દક્ષિણ દક્ષિણ ગુજરાત/નોર્થ કોંકણ ઉપર બહોળા વિસ્તાર માં છે જે 3.1 કિમિ ની ઊંચાઈ સુધી ફેલાયેલ છે. એક યુએસી 0.75 કિમિ ની ઊંચાઈ સુધી સેન્ટ્રલ યુ.પી. આસપાસ છે. 24 જૂન ના સૌરાષ્ટ્ર ના દક્ષિણ કાંઠા ના વિસ્તાર વેરાવળ થી લઇ ને અમરેલી થી અમદાવાદ સુધી પહોંચ્યું. ચોમાસુ ગુજરાત બાજુ વધુ આગળ ચાલી ગયું અને પશ્ચિમ સૌરાષ્ટ્ર બાજુ ઓછું ચાલ્યું જે ચોમાસુ રેખા માં સ્પષ્ટ દેખાય છે. 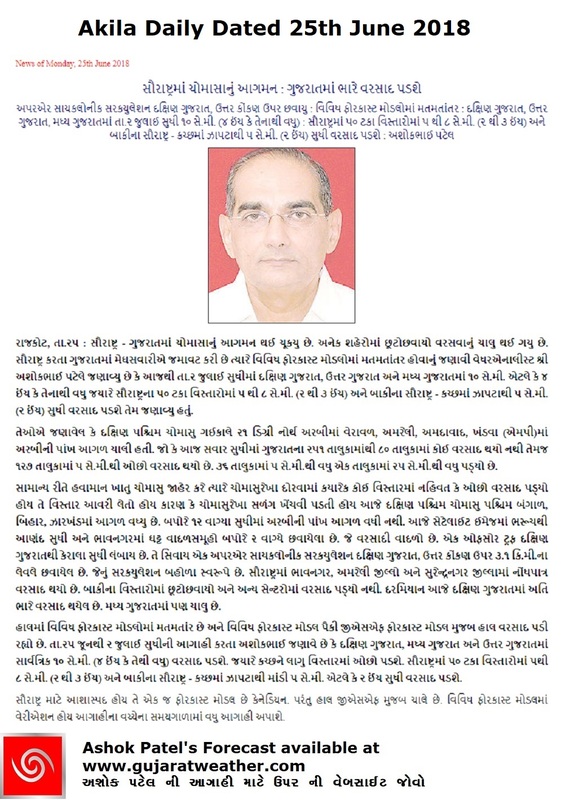 વિવિધ ફોરકાસ્ટ મોડલ વચ્ચે મોટો મતમતાંતર છે. હાલ GFS મોડલ મુજબ વરસાદ થયેલ છે. આજની આગાહી ની વિશ્વનીયતા દરેક વખત કરતા ઓછી સમજવી. ચોમાસુ સૌરાષ્ટ્ર ના હજુ થોડા ભાગો માં પહોંચ્યું છે જેથી ગુજરાત કરતા વરસાદ ની માત્રા ઓછી રહેશે. દક્ષિણ ગુજરાત, મધ્ય ગુજરાત અને નોર્થ ગુજરાત માં કુલ વરસાદ 10 સેન્ટિમીટર અને વધુ આગાહી સમય દરમ્યાન. જોકે કચ્છ ને લાગુ નોર્થ ગુજરાત માં માત્રા 10 સેન્ટિમીટર થી ઓછી. 50% સૌરાષ્ટ્ર માં 4 થી 8 સેન્ટિમીટર આગાહી સમય દરમિયાન કુલ વરસાદ. બાકી ના 50% સૌરાષ્ટ્ર અને કચ્છ માં ઝાપટા થી લઇ ને 4 સેન્ટિમીટર સુધી વરસાદ આગાહી સમય દરમિયાન. નોંધ: આ આગાહી ઉપર મદાર રાખી ને કોરા માં વાવવું નહિ. There is a UAC as a broad circulation at 3.1 km above mean sea level over South Gujarat/North Konkan and adjoining areas. There is a UAC over Central U.P. and adjoining areas at 0.75 km above mean sea level. The Southwest Monsoon entered Saurashtra yesterday. The NLM line passes though 21N, Veraval, Amreli & Ahmedabad and then towrds Khandwa in Madhya Prasdesh. Refer Map above. The rain quantum may not be evenly distributed over the areas where monsoon has on set over Saurashtra, since IMD has a criteria to draw continuous NLM line for areas of Monsoon onset. Various forecast models have differing outcome and today’s forecast has lower confidence of the outcome. Currently GFS is performing better than other forecast models in last few days. South Gujarat, Central Gujarat & North Gujarat will receive cumulative more than 10 cms. rainfall during the forecast period. Areas of North Gujarat adjoining Kutch can receive lower quantum of rainfall. Monsoon has not yet covered significant areas of Saurashtra so rain quantum would be much lower than Gujarat side. 50% Saurashtra is expected to receive 4 to 8 cms. cumulative during the forecast period. Balance 50% Saurashtra & Kutch will get Scattered showers/light rain on lower side and up to 4 cms. during the forecast period. 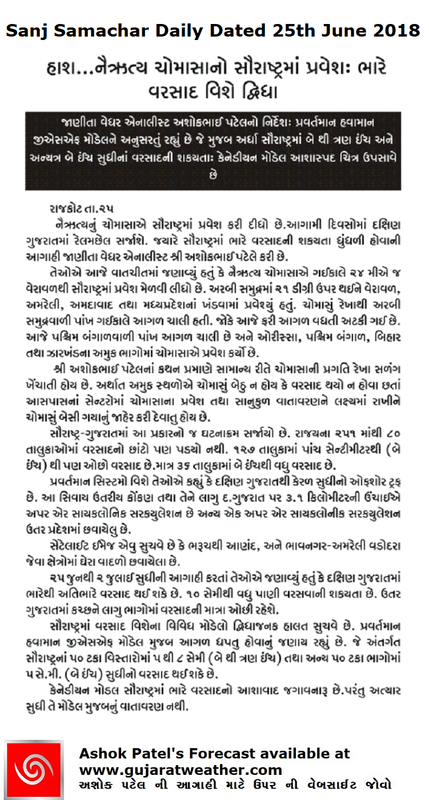 Note: Saurashtra/Kutch refrain from sowing without rain.